Ray has been teaching for nearly twenty years and is regarded as a sensitive and patient teacher, with a good sense of humour. 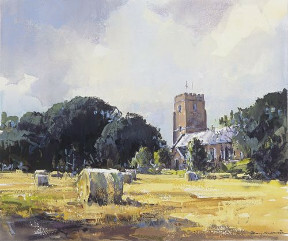 Students will be encouraged to sketch and paint in their chosen medium, working on location as much as possible. Alongside the painting will be a balanced mix of demonstrations, critiques and talks. The courses are suitable for all levels of ability except beginners. Set in a stunning coastal position, the Mullion Cove Hotel offers a variety of exciting painting locations nearby, including the harbour at Mullion Cove, spectacular Kynance Cove, Porthleven harbour and Cadgwith. New spacious purpose-built studio. Non-painting partners are most welcome. Tariff and Bookings. For further details contact the hotel direct. 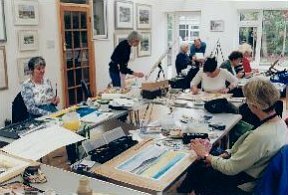 The purpose-built studio at our home 'Thistledown' in East Devon is our base for this course. The beautiful Exe and Otter Estuaries are a short drive away. 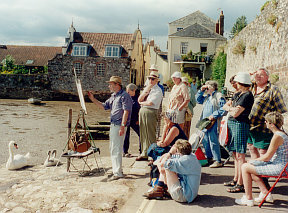 If you enjoy sketching and painting boats, water and skies then this course is for you. Further details and bookings contact Ray Balkwill. 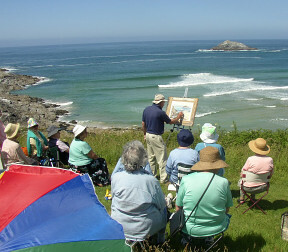 Ray Balkwill is now able to offer a varied programme of Power Point Presentations to art societies in the West Country. Some of these can also include an extract from either of his art instruction films. For further details and bookings please contact Ray Balkwill.